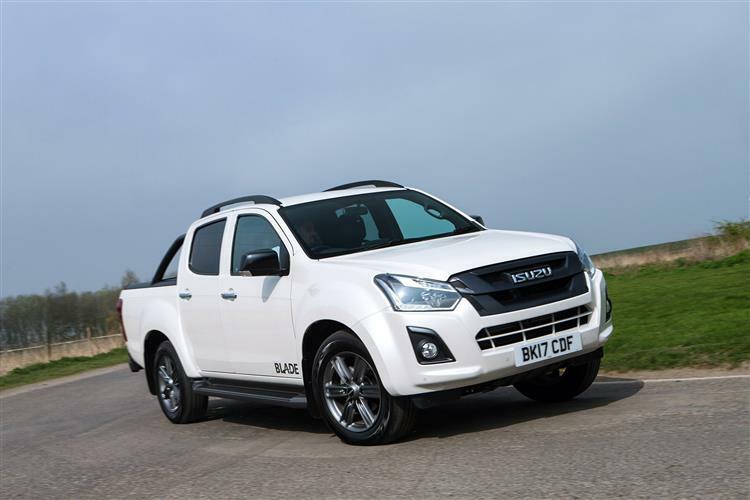 If you'd like an Isuzu D-Max pick-up, then the chances are that you'd like a very well-equipped and stylish one. A model in fact, like this Blade version, which offers a smarter interior and extra equipment. As before, it comes with a choice of six-speed manual or five-speed auto transmission and either a roller top cover or a full leisure canopy. Plus you get eighteen-inch alloy wheels, side steps, tinted windows, heated leather seats, a DAB stereo and a touch screen nav system. You get a very plush pick-up indeed then, yet one that, priced from under £27,000 [ex VAT] , isn't too much of an indulgence. 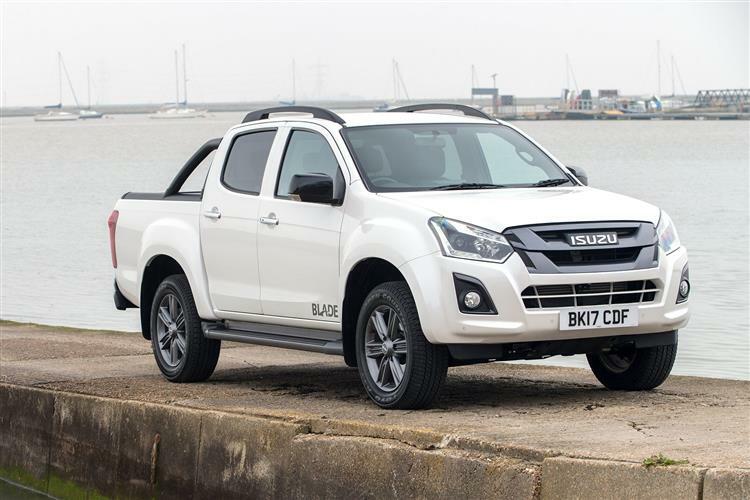 The ultimate 'Blade' version of Isuzu's D-Max pick-up is the flagship variant in the standard range. Jonathan Crouch drives the improved version. Isuzu's D-Max has carved itself a useful niche in the pick-up market, mainly thanks to the way its brand has listened and responded to the needs of likely buyers. Take this version, the Blade. It was first introduced in early 2014 to demonstrate the lifestyle potential of this pick-up, a whole host of extras included at an attractive asking price. 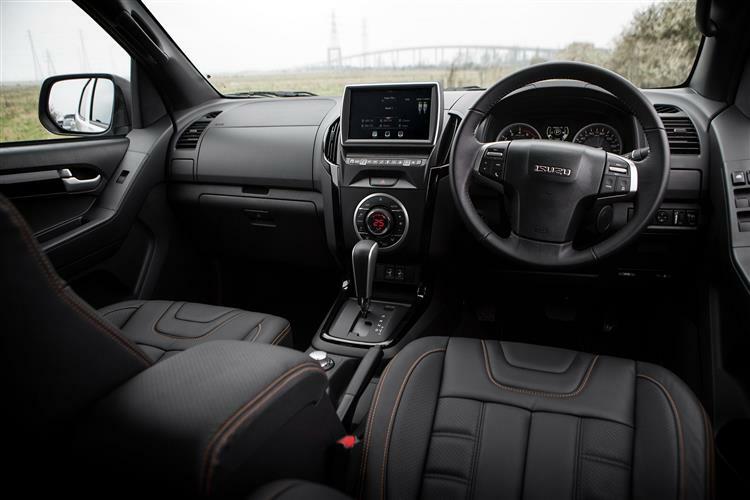 Customers liked the proposition, so Isuzu has further refined it into the form we look at here, which now delivers arguably the smartest cabin in the class, along with a few little extra touches to make ownership feel that little bit more special. Will it all be enough to convert the undecided? If not, it's hard to see what more Isuzu could have done. This Blade model gets the same fuel efficient 1.9-litre twin-turbo common rail diesel engine as you'll find fitted across the rest of the D-Max range, offered with a choice of either six-speed manual or five-speed automatic transmissions. This advanced Euro5-compliant unit generates 164PS along with a lusty 360Nm of torque at just 1,400 rpm. Get off the beaten track and, as usual with this model, you've the flexibility of a clever 'shift-on-the-fly' system, allowing the driver to adjust between two and four-wheel drive modes while travelling at speeds of up to 60mph. The front suspension arrangement is a proven independent double wishbone with coil-spring set-up, while the rear suspension is made up of leaf-springs installed above a special long span rear axle. Tough and fit for purpose in other words, though Isuzu also claims this system to offer better driving comfort. Under the skin, as with the brand's previous pick-ups, the D-Max is built on a rugged ladder-framed chassis, but the similarities end there. 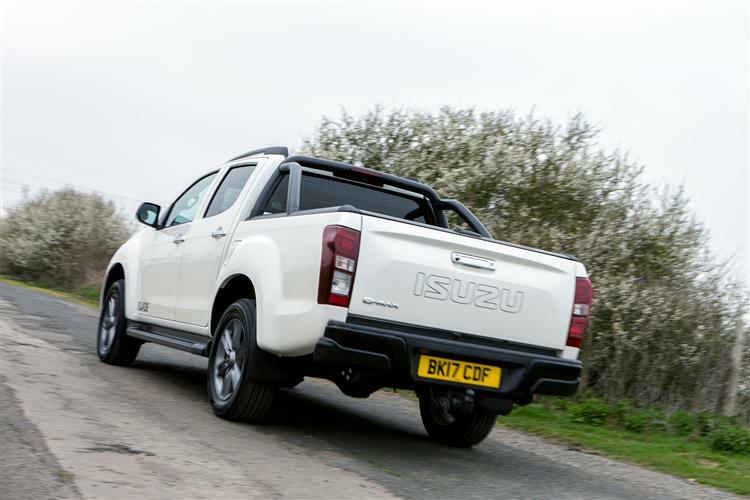 The i-GRIP (or 'Isuzu Gravity Responsive Intelligent Platform') underpinnings of the D-Max are 42% stiffer than those of this model's predecessor, the Rodeo, helped by improved cross bracing at the rear, which offers superior stability under load and when towing. On that subject, you get a 3.5-tonne (braked) towing capacity, to go with a payload capacity of 1,000kg. 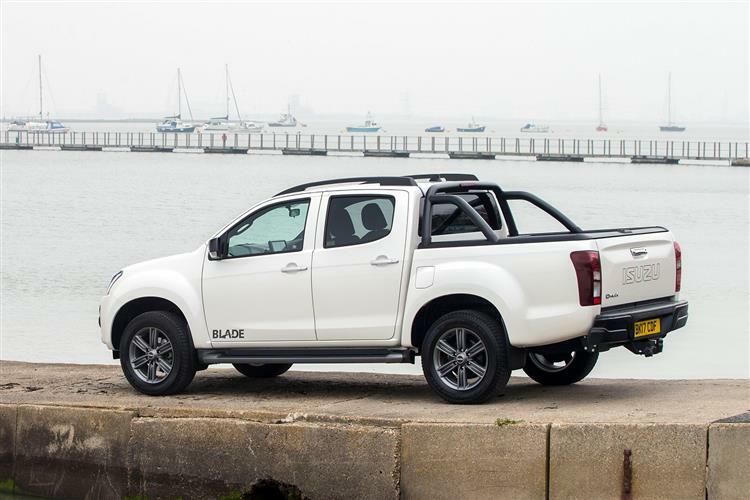 The D-Max Blade certainly looks the part, offering those who want a leisure-oriented pick-up something that's has some genuine visual impact. Those eighteen-inch six-spoke alloy wheels help here, and they're shod with some meaty-looking 255/60-18 Pirelli Scorpion Zero tyres. The front grille is finished in a sleek dark grey tone that matches those wheels, while the door handles and roof bars are painted in black, as are the folding door mirrors. Even the heavy-duty side steps haven't gone too big in chrome. Two paint colour choices are offered. The 'Pearl White' finish looks clean, but the Blade definitely looks meanest in mica Cosmic black. 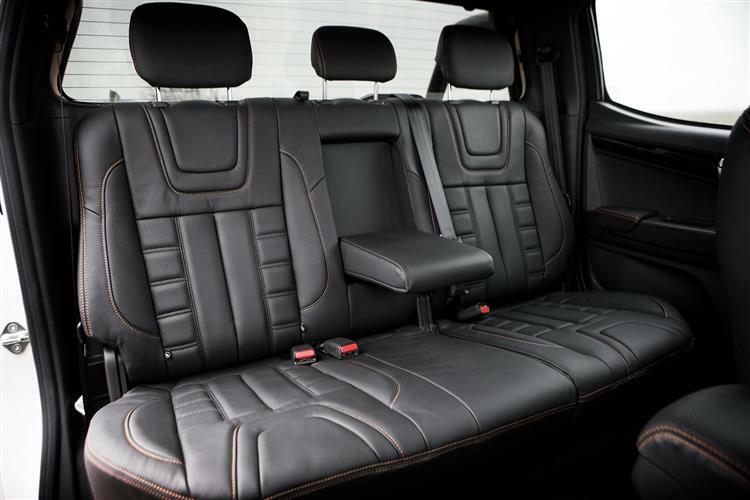 A priority in updating the Blade package was to introduce a classier feel to the cabin and you certainly get that with the upgraded Piano Black interior with its smart roof lining. The cab remains sturdy and practical though, if far from basic with its branded mats and smart scuff plates. It also helps that the D-Max design is in many respects quite stylish in its own right, the circle of minor controls on the centre stack for example, reminiscent of a Mazda RX-8 sportscar, plus a couple of ventilation 'ears' at the top of the fascia that aren't a million miles away from contemporary Ford design. Ease of use has also been thoroughly thought through, with wheel-mounted controls, big clear dials, easy access to the most important switches and a comfortable raised driving position. Move rearwards and there's even a decent amount of rear seat legroom, which isn't always the case with doublecabs like this one. 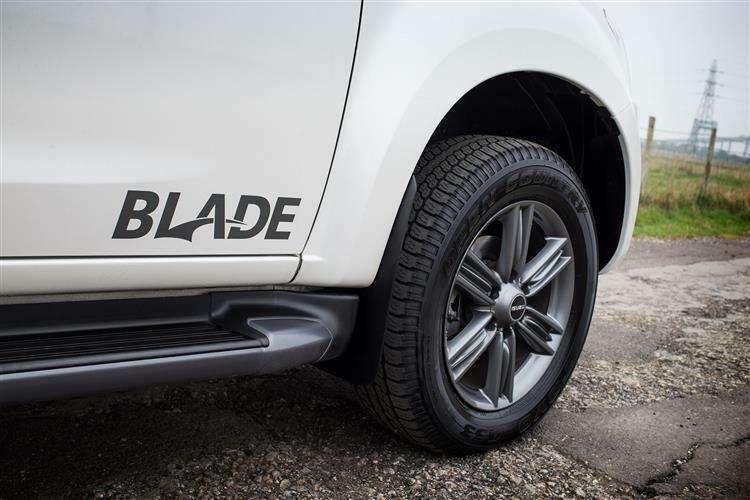 The Blade slots in at the top of a D-Max line-up that sees potential buyers otherwise choose between 'Utility', 'Eiger', 'Yukon' and Utah' derivatives. For a Blade model, you're looking at an asking price of around £27,000, around £3,000 more than its 'Utah' stablemate, the next model down. That seems pretty reasonable given the extra equipment delivered here. There's a £1,000 premium if you choose the option of automatic transmission. In return for that outlay, you get an awful lot. Tinted windows, a 9-inch multi-function touchscreen, a remote locking lower tailgate, Blade puddle lamps, front and rear parking sensors and a colour-coded Aeroklas canopy or sports bar with roller cover. Plus there are all the features you'd get on the lesser 'Utah' variant, including keyless entry with push button start, Apple CarPlay and Android Auto, satellite navigation, DAB digital radio, roof bars, leather upholstery with heated front seats, rear parking sensors and automatic air conditioning. Options include a bonnet protector, a loadbay bed rug, trendy lazer lights and a spare wheel bag. On to the loading practicalities for this double cab bodystyle. At around 5.3m long, this is certainly a pretty large vehicle, so you won't be surprised to retract the sturdy drop-down tailgate (which can only retract to horizontal level because of the chunky bumper) and find a pretty substantial cargo area on offer. You'll find a space 1485mm long, 1530mm wide and 465mm in depth - easily big enough for a euro pallet which can slide in the 1110mm-wide space between the wheelarches. On to running costs. This D-Max's efficient common-rail Euro 6-compliant 1.9-litre unit can return around 40mpg on the combined fuel economy cycle and the CO2 emissions figure is a very respectable 163g/km for the manual model. To help, there's a dual Exhaust Gas Recirculation system to cut down on NOx Nitrogen Oxide emissions. What else? Servicing is every 12,000 miles or 24 months. There's also three years of roadside recovery and assistance, a three-year paint warranty and six years of anti-corrosion cover. Plus you get a five-year / 125,000-mile transferable warranty which helps beef up those residuals and reinforces the reputation for durability and ruggedness for which Isuzu pick-ups have become renowned. Not that you're likely to need it. In development, this design underwent over four million kilometres of endurance testing, the equivalent of 100 times round the world. This D-Max Blade shows what a complete product Isuzu can now offer in the lifestyle end of the growing pick-up segment. It's certainly hard to think of anything else you could add to it. Eighteen-inch alloy wheels, a DAB stereo, sat nav, climate control, heated leather seats, mica paintwork, a choice of a cannopy or a roll-top to keep your gear safe - it's all there in the asking price. 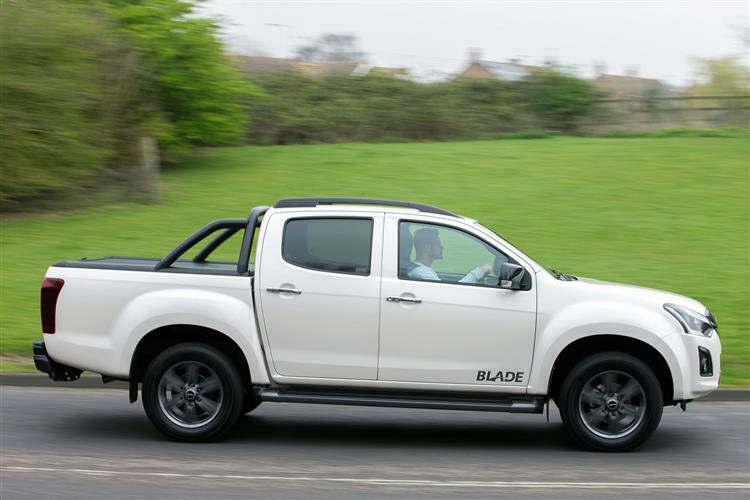 Before you go shopping elsewhere, start totting up those sorts of extras from the options list and then you might start appreciating what the D-Max Blade offers. Who says you can't have it all?